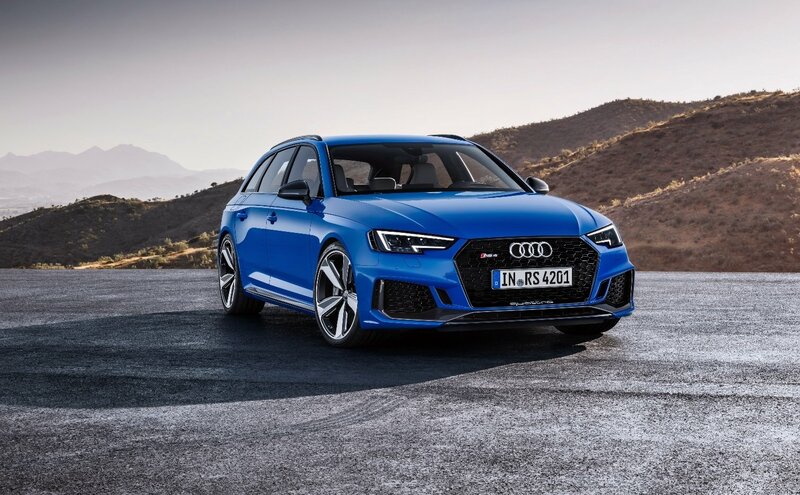 AN icon of performance has been reborn, with the launch of the fourth generation Audi RS 4 Avant, which combines high performance engineering with everyday usability, and just happens to have a 331kW 2.9-litre V6 TFSI bi-turbo engine jammed under the hood. Punching out a whopping 600Nm of torque, the RS 4 Avant features all-wheel-drive technology, RS sport suspension and Audi drive-select as standard. It’s capable of a zero to 100km/h time of just 4.1 seconds, with a top speed of 250km/h in standard guise, or 280km/h with the optional Dynamics package added on. Design-wise, lovers of the previous RS 4 variants will find massive air inlets and a flat single frame grille, inspired by the Audi 90 quattro IMSA GTO. Optional Matrix LED headlights display tinted bezels and the body features wider wheel arches and an RS-specific diffuser insert, while the oval tailpipes of the RS exhaust system and the RS roof edge spoiler make for a distinctive look. The exterior colour Nogaro blue, pearl effect available optionally from Audi exclusive recalls the first generation of the high-performance Avant from 1999. The new Audi RS 4 Avant travels on 19-inch forged aluminum wheels as standard; 20-inch wheels are available as an option. An optional rear sport differential is also available, should you want it to join forces with the sportily configured eight-speed tiptronic with optimised gear changing. THe add-on Dynamics package includes RS sport suspension with Dynamic Ride Control (DRC), ceramic brakes and RS-specific dynamic steering. Inside, the black interior underscores the sporty character of the Audi RS 4 Avant. The RS sport seats with optional honeycomb pattern, the flat-bottomed RS leather multifunction sport steering wheel, the shift gate and the illuminated door sill trims are all adorned with the RS emblem. In the Audi virtual cockpit and head-up display, RS-specific displays indicate the g-forces, tyre pressures and torque. The 2018 Audi RS 4 Avant will arrive in Australia in April 2018.